Take That are one of the biggest British boy bands to come out of the 1990s. Splitting in 1996 they later reformed in 2006 to great success and a slew of hit singles. The band consists of Gary Barlow, Howard Donald and Mark Owen. Ex-members are Jason Orange and Robbie Williams. 1993 saw the release of Everything Changes, based on memeber Gary Barlow's original material. It peaked at number one in the UK and spawned six singles, with four being consecutive UK number one singles – their first number one "Pray" "Relight My Fire", "Babe" and the title track "Everything Changes". In 2017 Take That celebrated their 25th anniversary, marked by the release of their fifth official greatest-hits and their eighth studio album, Wonderland. 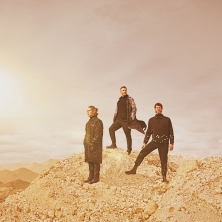 Eventim is the place to look for Take That tickets and tour dates. To be the first to hear when more Take That tickets go on sale you can sign up to the Eventim Ticket Alarm below.